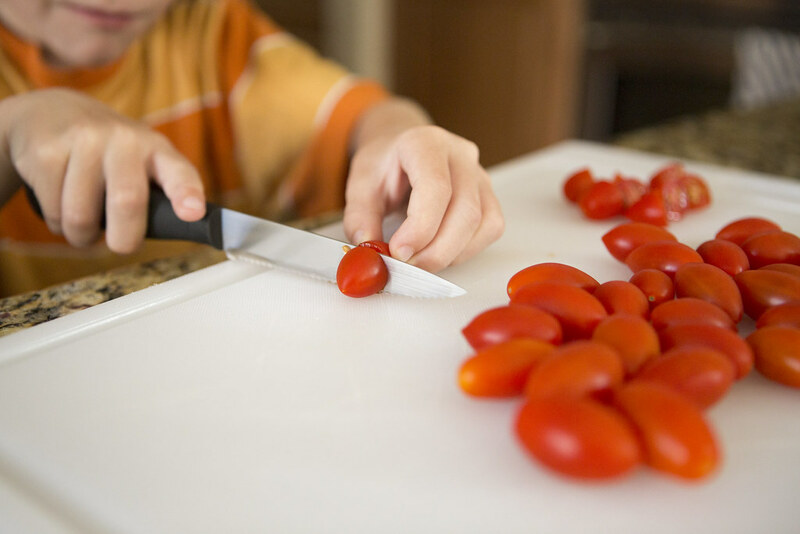 Summer usually means a few things- one: it will be hot; two- the kids will seem to have a never ending appetite and three-it is the perfect time for kids to learn to cook. Since it is so hot, I love finding a good summer recipe that I can cook fully on the stove, no need to turn on the oven. I also want a lighter dish with fresh ingredients. 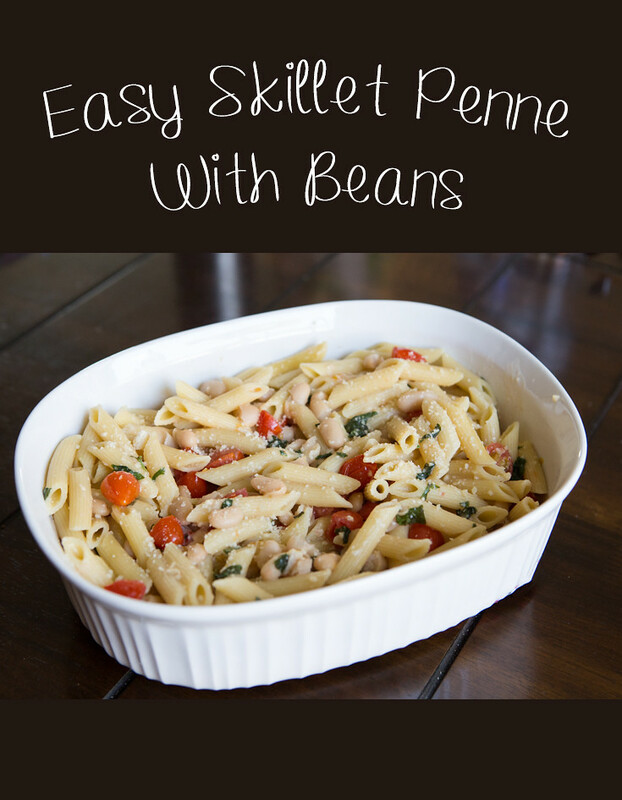 The Skillet Penne with Beans is a perfect summer time dish. 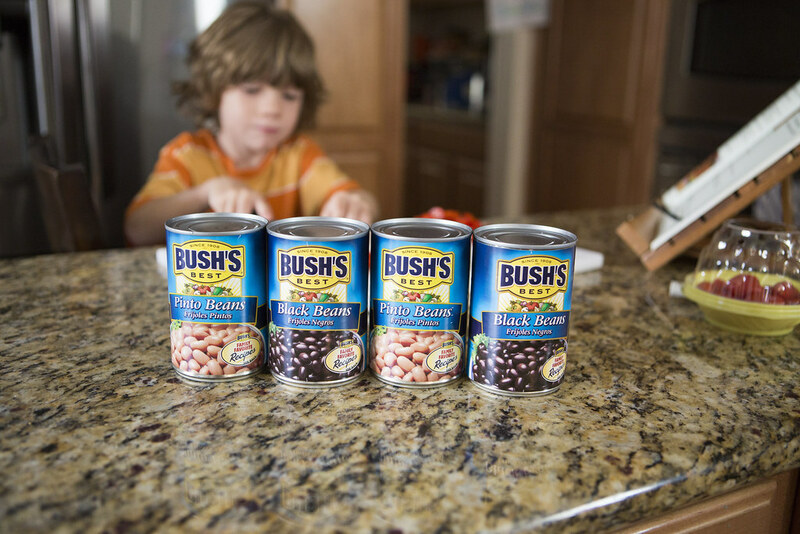 Thank you to Bush's Beans for sponsoring this post and letting me share this perfect summer time recipe. This summer I have had each of my kids pick one recipe each week to make. Ryder was my helper for the Skillet Penne with Beans. I love that this dish has only a few ingredients, including Bush's beans which is a great staple to have on hand for last minute recipes. I will often grab a few extras cans on my trips to Walmart, where they are readily available. 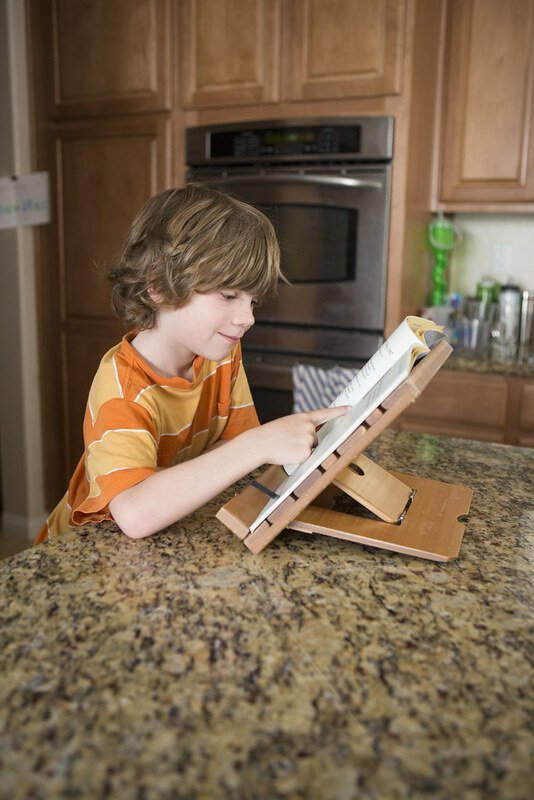 I love that when Ryder cooks, not only is he learning to cook but he is practicing reading while following the recipe. It definitely takes a little longer to cook when kids help, but I really don't mind as I feel like a good mom and am totally engaged and present when we cook together. The other great thing about having kids cook, is their willingness to try new recipes. If I had made this on my own, the fact that it has cherry tomatoes and *gasp* green things, probably would have made my kids turn up their noses. When they are involved cooking the recipe they seem to take ownership of it and are willing to try it without any complaints. It definitely is a win-win. What is one of your favorite summer recipes? 1. In a Nonstick skillet over high heat add: chicken broth, water, salt, penne pasta. Stir often and cook for 15-18 minutes. 2. While the Pasta cooks, halve the tomatoes. 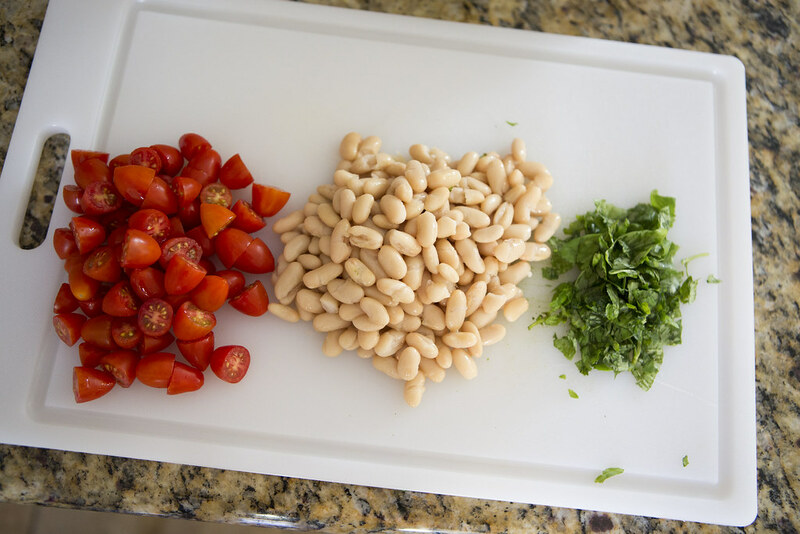 Rinse the can of Bush's Cannellini Beans. Chop the olives. 3. Add the ingredients from step 2 when the pasta has cooked about 15 minutes. Stir and let the ingredients cook for about 3-5 more minutes over low heat. 4. While those ingredients cook: chop 1/2 cup Fresh basil, grate 1/2 cup parmesan cheese. 5. Remove from heat and stir in basil, cheese, 2 T. olive oil and 2 T. fresh lemon juice. Season with Salt and pepper to taste. So cute! 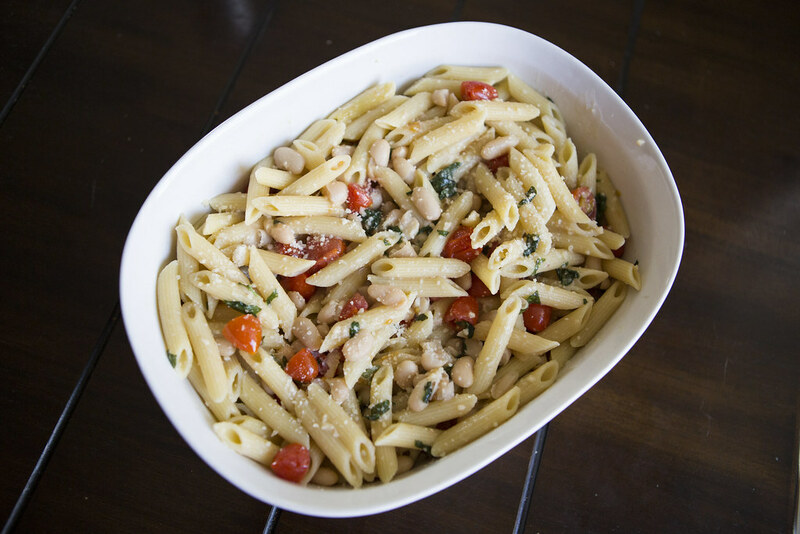 I love cooking with the kiddos and this looks easy, but delicious! I love that you added beans to this! They fit perfectly with this recipe. I'd never have thought to use beans with pasta! This looks delicious! How cute and looks yummy!! Ohhh. Looks so easy and yummy! This looks delicious! My son loves cooking with us! This is great! Especially since we have so many grape tomatoes to use up right now! Love cooking with my son! What a great recipe! You're so right, Summer is the perfect time to start cooking with kids. This is a great dish. Pinning for later.